Bacterial resistance is a growing problem worldwide and is estimated that deaths by infectious diseases associated with resistant pathogens will generate 10 million deaths per year in 2050. This problem becomes more serious due to the low level of research and development of new drugs, which has fallen drastically in the last 40 years. 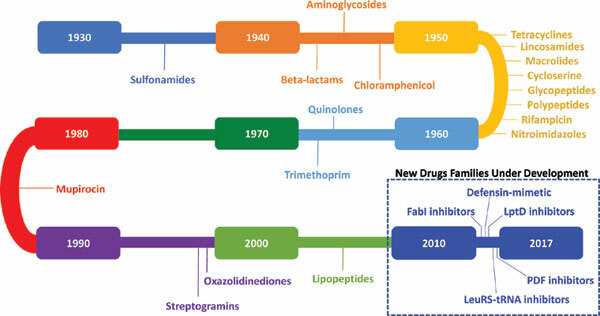 For example, in the last decade of a total of 293 new drugs approved by the FDA, only 9 corresponded to antimicrobial drugs and none constituted a new structural class. The majority of the molecules in the clinical phase II or III, coming from modifications of drugs in clinical use, this strategy makes easier the bacterial susceptibility to generate resistance through the mechanisms expressed for their drug predecessors. Under this scenario, it is urgent to generate the most novel strategies for the development of antibacterial compounds with new targets or mechanism of action, without a structural relationship with the antibiotic drugs predecessors. Under this look, the present review addresses the development of the latest antibacterial drugs in clinical phases II and III, analyzing the design strategies by which these new molecules were obtained and the structure-activity relationship of these new families of antibiotics, in order to define the state of the vanguard antibacterial drugs in the post-antibiotic era. Antibacterial agents, Antibiotic Development, New drugs approvals, Clinical development, New mechanism of action, Antibiotic resistance.